Last week, photos of last generation video game consoles have appeared online in China. No, these aren't any regular old photos, the consoles in these photos are in retail display kiosks inside Chinese brick and mortar electronics shop Suning. These photos have spurred up the talk that China's video game console market will open up soon and that systems will legally be sold soon. The images show game consoles in either unfinished or poorly made display kiosks inside Chinese electronics retailer Suning in south central China's Su Zhou. 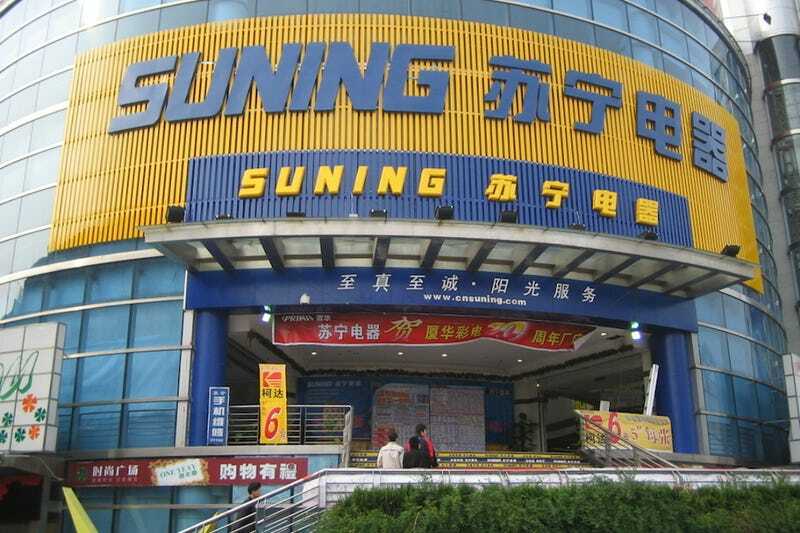 Think of Suning like a giant Chinese Best Buy. For those readers who don't know, China's technically had a 13-year long ban on video game consoles. The ban was put to bed late last year with the opening of the Shanghai Economic Free Trade Zone. It's unclear if the lifting of the ban will actually do anything as consoles are still not being sold in China. But with these photos doing the rounds, Chinese media outlets seem to think that the lift has happened and that console sales are impending. The folks over at GamesInAsia are skeptical but they point out that Microsoft has had a partnership in China; they released the Microsoft Surface in China at Suning first. I too am very skeptical of the images—though, I do believe that the first generation of consoles to be sold in China will be the Xbox 360, PlayStation 3 and Wii. On top of that, the new generation has just begun, so it might make sense to ease China into the current gen. I'm skeptical because the images don't exactly prove that they're taken in a Suning, and because the Microsoft Logo is outdated. Kotaku visited two Sunings in Beijing and found nothing. The closest thing we found to a video game console was someone playing Angry Birds on a Kindle Fire. When we asked a sales person at the store, they replied that they did not know. On top of that, call's to Suning's corporate office returned with another "we don't know." Kotaku has reached out to Microsoft's China branch for comment and will update should the company comment. Despite the fact that I'm super skeptical, I hope I am wrong. Earlier this morning reports have come that the regulations over game consoles in the Shanghai Free Trade Zone has changed and that game consoles are permitted for sale in China. Chinese media have already posted that the console ban has officially been lifted. The government issued statement only says that the previous regulations are under new consideration...whatever that means. So perhaps consoles might actually be out in China soon.